Most impressive are the gains the Philippines has achieved under your aegis. Your program of good governance deserves kudos. More power to you! While the country is facing two-pronged dangers, to wit, the Chinese incursion into Philippine territory (we have to thank Gloria Arroyo for that) and the rotten individuals seeking office in the forthcoming presidential elections, please bear in mind that a lot of Filipinos are aware of these dangers. Suffice it to say that we have to sustain, nay improve on the gains in the political, economic and social fronts thus far achieved. Thanks to the World Wide Web, the correct information is accessible in real time. We appreciate the fact that your governance has acknowledged that information is a basic need, and you have addressed this need with the provision of WiFi hotspots all over the Philippines. Which brings us to the importance of real surveys—surveys not paid for by vested interests. These paid surveys are nothing more than conditioning the minds of people for them to accept their cheating in the elections. First, the survey is done in real time, with strict protocols and one person one vote. Second, the survey is free to access anywhere in the world, so that our kababayans abroad can participate too. The survey started April 17 and will end on May 17. 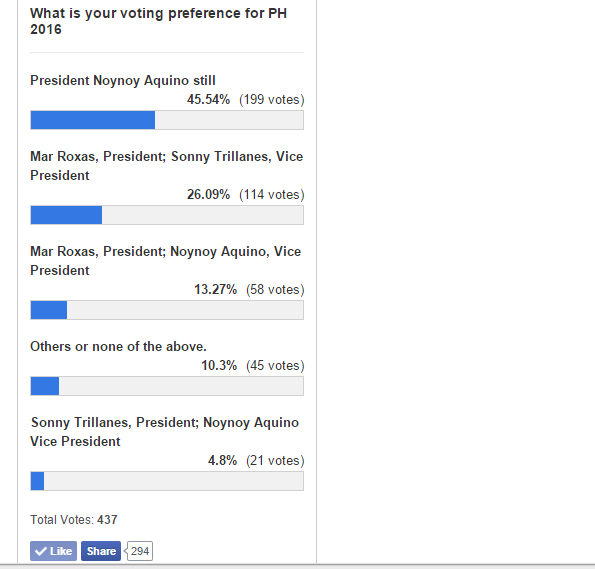 Here is a snippet of the poll results, so far. Please consider this as our contribution to an enlightened Philippines.